Bowling Green is going through a difficult stretch. The Falcons haven’t played well overall during their last seven games, going 2-3-2 in a stretch that included five teams with a losing record. They’ll attempt to improve their play Friday and Saturday nights when they host Ferris State in a Western Collegiate Hockey Association series. Most recently, the Falcons didn’t play well last weekend in a 5-2 loss and a 2-2 tie at Bemidji State. The Beavers outshot BG in both games, and erased a 2-0 deficit in the last four minutes to earn the tie in Game 2. The series was BG’s first of the season in which it did not win at least once. “We had found a way win games over the weekend prior to this past one, but I don’t think we’ve played well enough,” BG coach Chris Bergeron said. “This weekend, it came to a head, and we weren’t able to get a win. The Falcons still are ranked eighth nationally with records of 15-6-5 overall and 11-4-3 in the WCHA. “Coming away from the (Bemidji) weekend, the biggest glaring thing was our process, not even close to good enough,” Bergeron said. The Falcons also lost a 3-1 decision at home Jan. 16 to Lake Superior, which has won just seven games this season. BG has received increased attention in the national polls during the last month. “At what point, do we realize we have a target on our back?” Bergeron said. “We’ve got a responsibility to ourselves and each other to play to a certain level, that level we’ve set. WCHA: The Falcons are third in the WCHA, six points behind Michigan Tech. But BG is just five points ahead of fourth-place NMU, and nine points ahead of fifth-place Ferris and Bemidji. 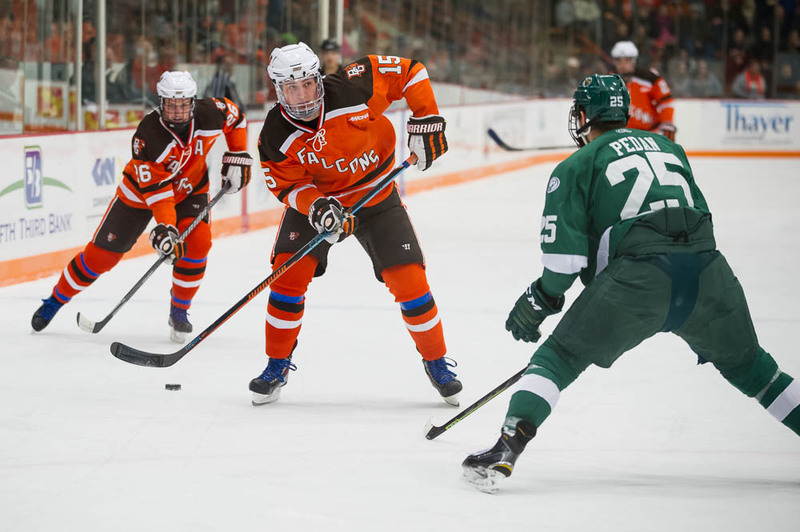 BG plays back-to-back series against Ferris, and then hosts NMU. The Falcons, Bemidji and Ferris each have two games in hand on NMU. The games in hand are this weekend as NMU plays a nonleague series against No. 7 Minnesota-Duluth. “We’ve given ourselves a little bit of a cushion, but we all know that can go away if we don’t play well over the next six games,” Bergeron said. BACK-TO-BACK: After playing in the Ice Arena this weekend, the Falcons will visit Ferris Feb. 13-14 for a two-game series. The original schedule didn’t have the back-to-back series. 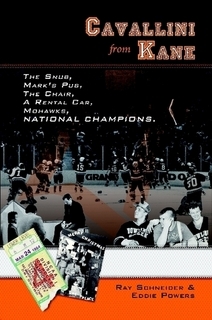 One of the series was to be played Thanksgiving weekend, but was moved to February to allow Ferris to play Wisconsin in a nonleague series. The Falcons haven’t played the same league opponent in back-to-back series before during Bergeron’s four-plus seasons as head coach. Last season, BG played Minnesota State twice in a three-week stretch. “We’re preparing for the next opportunity which is Friday. It’s not prepare for the next four games,” Bergeron said. PK: The Falcon penalty-killing remains first in the nation at 93.3 percent (97 of 104). The only other teams at 90 percent or better are Vermont (91.6, 87 of 95) and Cornell (90.7 percent, 68 of 75). Ferris’ power play is next-to-last in the WCHA at 10.3 percent (12 of 116). PP: The Falcon power play was 0 of 7 at Bemidji and is fourth in the WCHA at 16.3 percent (17 of 104). Ferris’ penalty-killing is fourth in the league (85 percent, 91 of 107). RETURN TRIP: Bergeron said last Sunday’s heavy snow turned BG’s 14-hour trip home from Bemidji into approximately an 18-hour trip. The Falcons arrived home Sunday night about 6. Bergeron said the snow started when the team was in the Chicago area. The bus then had to stop every 15-20 minutes, so the drivers could clear the windshield wipers of ice and snow. The trip from Chicago usually takes 4-5 hours, but took 7-8 hours last Sunday. INJURIES: Outside of the usual bumps and bruises, Bergeron said the Falcons have no major injuries.